.-= Iva @ Horizontal Yo-Yo´s last blog ..Silly Haiku Wednesday – July 15 =-. Hi Miss Jenn, I’m loving doing these. Thanks for the fun. My haiku is exactly how I spent my day yesterday. thanks for the link to your blog. i’m so glad you’re participating. i’m sorry but i am terrible at poetry. haiku especially. .-= melissa stover´s last blog ..Using your camera without reading the manual part 1 =-. Everyone’s haiku was awesome! Thanks for participating! .-= Jade´s last blog ..Is it Still Wednesday Anywhere? =-. Hi Jenn, just checking. I see you got the widget. I will read about Haiku, cause I am not familiar with it. Thanks for stopping by. .-= Ebie´s last blog ..Sky Watch Friday: City Skies #2 =-. ahh I missed it! Sorry :( I will do it next time I swear! .-= Shannanigans´s last blog ..Had to Share =-. Lovely haikus here. Great blog too. .-= Pacey´s last blog ..A Girl’s Moment =-. Happy Birthday! My ode to birthdays in Haiku form is on my blog! 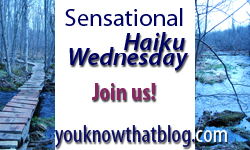 .-= Shana´s last blog ..It’s Haiku Wednesday, Yo. =-.